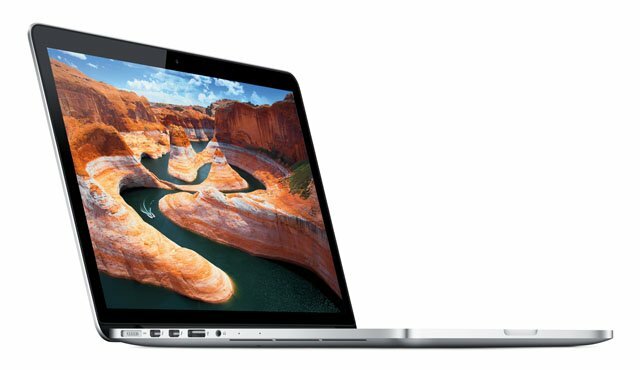 When I reviewed the latest version of the 13in MacBook Pro just a few months ago, it seemed to me that Apple was getting a bit complacent. The mid-2012 update did gain a new Ivy Bridge processor, but the modest speedbump that this produced no longer justified the MacBook’s starting price of £999 – especially with classy new Ultrabooks such as HP’s Spectre XT selling for £899. In contrast, the 15in version of the MacBook Pro released at the same time got itself a major overhaul, sporting a slimmer, lighter design and becoming the first Mac to sport an eyeball-gasmic Retina display. It was clearly only a matter of time before the 13in model got the Retina treatment too. Indeed, the new 13in MacBook Pro With Retina Display finally delivers the upgrade that we should have got five months ago – along with yet another hefty price increase. Like its 15in counterpart, the display is very impressive. Even at 13.3in, it delivers a resolution of 2560 x 1600, which is a little lower than the 2880 x 1800 of its 15in counterpart. To put this into context from a desktop perspective, it’s still higher than the 2560 x 1440 resolution of the 27in screen that I use for Photoshop work in my office. The image is quite luxurious – pinpoint sharp, with rich, bold colours, and the IPS panel ensures that the image stays bright and clear through a viewing angle that is pretty close to Apple’s claimed 178-degrees. You can even read text clearly from way out to one side, so smooth and sharp is the font rendering on the Retina display. And, like its 15in brother, this model does the same scaling trick that allows it to ‘look like’ a lower resolution display by adjusting the size of text and icons to enhance visibility for those of us that don’t have high-definition eyeballs. I was also pleased to see that the screen isn’t as reflective as it used to be. It still has a glossy finish, but in an office environment, the glare and reflection from the overhead lighting was noticeably reduced and less annoying. It’ll be terrific for browsing through your photo collection or watching movies and TV programmes.